More than 58,000 votes poured in to Blue Ridge Outdoors Magazine’s Microbrew Madness Tournament, which pitted 32 of the Southeast’s top craft brewers against each other in a single-elimination style bracket match-up. After six weeks of head-to-head face-offs, Devils Backbone Brewery narrowly edged Highland Brewing Company for the top spot. And this really was a close fight, so hats off to both breweries. Located on the famous Nelson 151 corridor, Devils Backbone features a beautiful mountain setting with a brew pub and restaurant that draws quality live music throughout the week. With The Outpost location in Lexington, Va., Devils is able to distribute their beer throughout the southeast making it one of the most widely known, and enjoyed, breweries in the region. Devils Backbone has earned a reputation for brewing a large variety of quality beers with universal appeal while hosting some of the best music, and views, in the area. Among these beers you’ll find Devils Backbone’s Vienna Lager, a chestnut-colored beer with a toasty sweetness and smooth, malty finish that’s light and balanced. Our readers are not the only ones who love this beer; it won the gold for Vienna-style lagers in the 2012 World Beer Cup, the biggest brewing competition in the world. 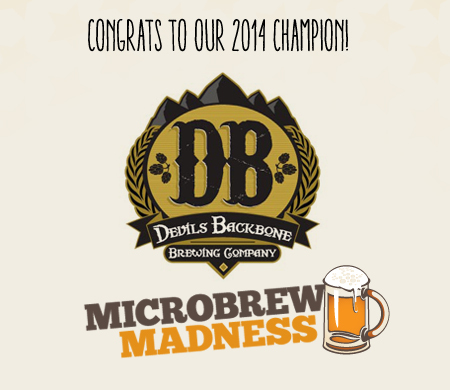 Devils also holds two Great American Beer Festival awards for Small Brewing Company of the year in 2012 & 2013. The close second in this year’s Microbrew Madness Tourney was Highland Brewing Company’s Gaelic Ale, exceptionally balanced between malty sweetness and delicate hop bitterness. This was Highland’s first beer and has been a perennial favorite for nearly two decades. Highland Brewing Company, based in Asheville, N.C., was one the first microbreweries in the South and really set the standard for years. Established in 1994, Highland was a three-man labor of love for many years, selling only kegs to local bars. Today, they produce 20,000 barrels a year — Gaelic Ale accounts for half of their total production. The top 32 microbrews in the bracket included ales, IPAs, lagers, and stouts from Maryland to Georgia. Parkway Brewing, based in Salem Va., and Asheville’s Lexington Avenue Brewery earned spots in the Final Four. Mother Earth Brewing (Kinston, N.C.), Heavy Seas Brewery (Halethorpe, Md. 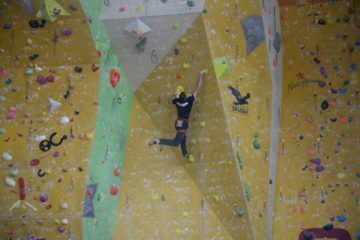 ), Three Notch’d Brewing Company (Charlottesville, Va.), and Southern Appalachian Brewery (Hendersonville, N.C.) were other top vote-getters. For more information contact Dusty Allison at Blue Ridge Outdoors magazine; (828) 225-0868.